by bbc.com-- Mr Ghosn, seen as a titan of the car industry, was detained by police and dismissedby Nissan last week. Claims against the businessman, who led the Renault-Nissan alliance, include falsely reporting his earnings. Public broadcaster NHK, which first disclosed Mr Ghosn's arrest, reported he had told investigators there was no intention to under-report his earnings. He has not spoken publicly. Greg Kelly, a former Nissan executive arrested along with Mr Ghosn, was quoted by NHK as defending his boss's compensation, saying it was discussed with other officials and paid out appropriately. Japanese prosecutors claim the two men conspired to understate Mr Ghosn's remuneration by about half the 10 billion yen ($68m) he earned at Nissan over five years from 2010. The company has also made other allegations about use of company money. Nissan reportedly formed a "secret" team earlier this year to look into alleged financial misconduct by Mr Ghosn, who had been hailed a hero in Japan for turning around the ailing Nissan. But there are suspicions about the timing of Mr Ghosn's downfall, which came amid concerns about the future of the Renault-Nissan partnership He is thought to have been planning deeper business ties between the carmakers, something that some Nissan executives feared could see their company reduced to a junior partner. Civil damages: Brazil-born Mr Ghosn, aged 64, is in custody in a Tokyo detention centre. On Wednesday, prosecutors successfully applied to extend his custody for an additional 10 days. Separately, Nissan is considering filing a civil damages suit against Mr Ghosn over his expenses and alleged use of company money to buy property, Japan's Kyodo News reported. 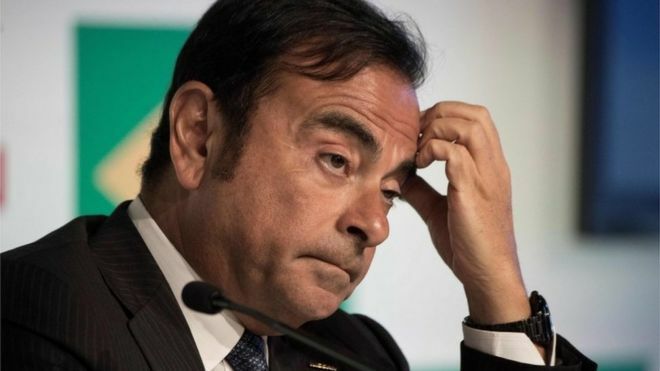 His arrest raises a question mark over the future of the partnership between Renault, Nissan and, since 2016, Mitsubishi. The three companies are bound together by cross-shareholdings that could be complicated to unpick. Renault had not removed Mr Ghosn as chairman and chief executive, but has instead appointed an executive to take charge on a "temporary basis". On Sunday, France's finance minister, Bruno Le Maire, said the government and Renault had yet to see evidence to support Nissan's allegations. He also told BFM-TV that France was keen to pursue a strengthening of the alliance "that would respect existing cross-shareholding". Executives of the three companies are thought to be planning a meeting this week, their first gathering since Mr Ghosn's arrest. The meeting was due to be held in the Netherlands with a video conference available for executives who cannot attend, Japan's Yomiuri Shimbun reported. Nissan hopes to announce the appointment of a successor by the end of December. But the success of the alliance was put down in large part to Mr Ghosn's drive and charisma, and analysts say he will be a hard act to follow. Mr Ghosn, feted as a corporate superstar in Japan, had licence to make bold moves. He was, for example, an early adopter of electric cars, investing heavily in the technology despite scepticism from much of the motoring world.